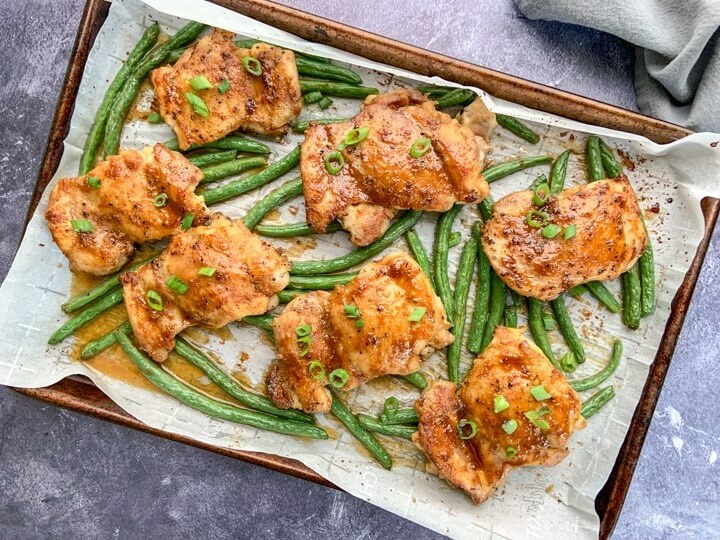 Baked Chicken and Green Beans made with boneless skinless chicken thighs in a luscious glaze made from fresh oranges, orange zest, coco aminos, fresh ginger, and minced garlic. 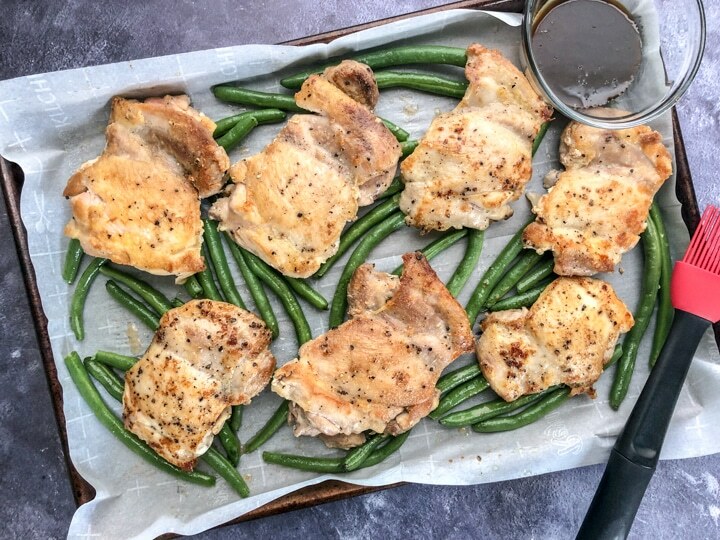 Oven Baked Chicken and Green Beans is the perfect meal if you’re looking to control your carb intake or if you’re just looking for a healthy and delicious meal. The orange glaze is naturally sweetened with fresh oranges which adds a bit of a twist. So, if you’re looking to amp up your weeknight dinner game, this baked chicken dish should definitely make its way into your weeknight dinner rotation. It’s simple to make and uses minimal ingredients. It’s a MUST try. Although I used boneless skinless chicken thighs for this oven baked chicken dish, drumsticks, wings, bone-in thighs or breast would be great as well. You have 2 options in making this dish. Option 2 is an additional step I take to add a caramelized color to the chicken, but it’s not necessary. Remove chicken thighs from oven and garnish with sliced green onion. Garnishing is optional. Color: One of the major difference between white meat and dark meat is of course the color. But, you may ask yourself what exactly contributes to the difference in color? The answer is due to the type of muscle called myoglobin. Dark meat has more myoglobin that white meat. Amount of Energy: Interestingly, the dark meat such as the drumsticks and thighs require more energy as those parts of the body are used for walking and for sustaining the weight of the animal for long periods of time whereas the white meat (i.e. breast and wings) do not require as much energy and are used for short bursts of energy. Amount of Fat: Dark meat has more fat between the muscles which makes it juicer and more flavorful compared to white meat which has a single muscle. Although this dish is complete being served with fresh green beans, it would also be great served with these Oven Roasted Potatoes. 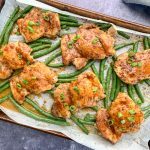 A quick and simple Baked Chicken and Green Beans dish in a flavorful orange glaze. The perfect weeknight dinner that you and your family will love. Trim, wash, and pat dry fresh green beans. Drizzle with avocado oil or extra virgin olive oil. Season with salt and spread into a single layer in a baking sheet. OPTION 1: Wash, pat dry chicken with paper towel and season with salt and pepper. 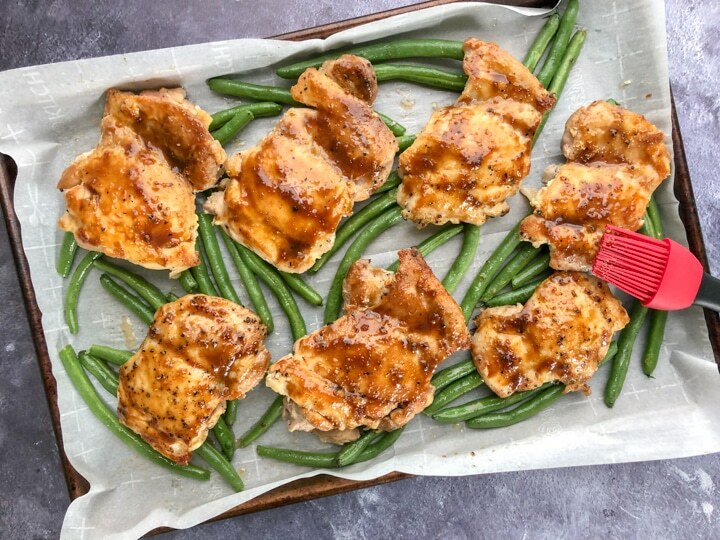 Place chicken on top of bed of green beans and baste with orange glaze. During baking, baste chicken again and place in preheated oven for about 25 to 30 minutes or until internal temperature reaches 165 degrees. OPTION 2: Wash, pat dry chicken with paper towel and season with salt and pepper. Add avocado oil to a pan over medium high heat. Add chicken thighs and quickly sear both sides for about 5 minutes. Remove chicken from pan and place on bed of green beans. Baste with orange glaze and place in oven. During baking, baste chicken again. Bake for 20 to 25 minutes or until internal temperature reaches 165 degrees. If you prefer more orange glaze, make a double batch. If orange glaze thicken before basting, heat it up and it will begin to loosen. I tend to use OPTION 2 as I like to sear the chicken thighs to create a nice brown coating, but it's not necessary.